Replies: 34 (Who? ), Viewed: 77432 times. #1 27th Feb 2006 at 10:34 AM Last edited by tiggerypum : 26th Jan 2007 at 2:55 AM. Sometimes if the changes to your meshes are very small, you might not need to adjust the uvmapping. But other times, it's really important to take the time to do so, so that your meshes and textures will display at their best. 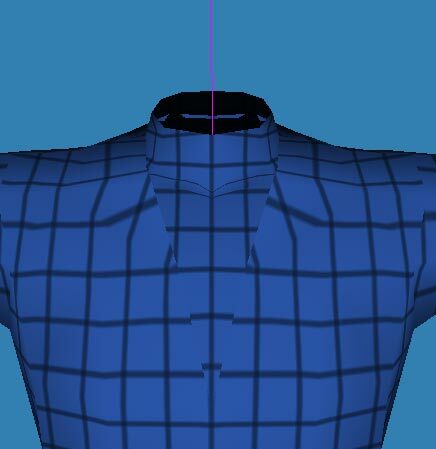 Here is an excellent example of why one would want to adjust the uv map; When I modified the scrubs mesh to make the medieval meshes for men and elders – I eliminated the v neckline, getting the seam to blend almost perfectly in the mesh. But… when I went to check the uv mapping, the texture did not connect smoothly across the seams. In order to check the uv mapping and make adjustments, first you need to create a Material in the project, and then assign it to the body. 9)	right click on the window showing your mesh, and select ‘TEXTURED’ to see the material on the mesh. Now, when I zoom in on the neckline, I can see that unfortunately, the texture does not cross the seams well at all, it’s not lined up. If I leave it mapped like that, it will be almost impossible to make the shirt front look smooth or put any designs across it. So I want to fix it. When you export an OBJ file from SimPE (for a Meshtool modification) the body UV Map in Milkshape is appears below the texture instead of on top of it. My example mesh was created as an OBJ file, and although it might be a bit confusing to see the map below the texture, I am using it because it is such a good example of why to take the time to fix the uv map. When you look at the picture below, you can see the uv map points are visible below the texture. That is okay, because we can move around in the window, and zoom in and out, so to have the best view, if the points show up on the texture or not. Now I'm going to change the scaling setting to 2, and I'm going to use ctrl-leftmousebutton to move the view so that I can focus in on the neckline area. I'm going to checkmark REDRAW, so my changes will show up as I make them. Time to start moving the uv map points around and fixing up the mesh. To select a point – be sure the SELECT button is clicked and then hold down the mouse button and drag over the point(s) you wish to select. You can hold down the shift key and click-drag again if you want to select yet more points. Then you can click on MOVE or SCALE and then move your mouse to drag the points around. I seem to always want to move the points in the wrong direction, and it takes a while for me to adjust to how I need to move them to get the results I want. This is picky fiddly work, with very small movements of the points to get things just right. You can use UNDO from the menu to step backwards, if you are not happy with the way you moved the points. Now I am at a spot where I'm not sure which points are part of the central triangle and which are part of the main body, so I can select them in the Texture Coordinate Editor. I want to focus on the central triangle area, so I first close the Texture Editor window. Then I went over to my mesh and selected the FACES of the central triangle area I wanted to focus on. Then I went back into the Texture Editor, and only those points appeared, which will make it much easier for me to pick them and move them. When I want to go back to seeing all the points, I can close the Texture Editor, do a 'Select All', and then open the texture editor again. Take your time, relax, take a break if necessary. Slowly your mesh will come together…. And in the end, it can look like this! Included below are two template bmp files which you might like to use to fine tune your uv maps, enjoy! 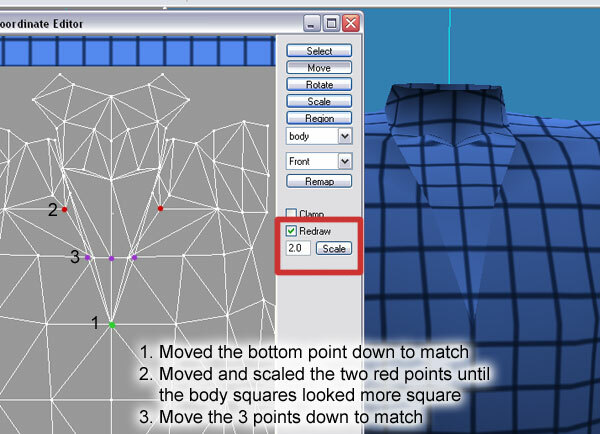 The mesh shown is only the second mesh I edited, and the uvmap is indeed still a bit distorted at the neckline, not all the squares are 'square'. But as I got the lines to match across the seam, I stopped at that point. I expect if I tried again now I might be able to get it a bit better, but the distortion barely shows on the finished mesh. As uvmaps are stretched over the body, you might not always be able to get things perfectly square or even, but the closer you get, the better textures will look on your mesh. While we're discussing uv maps, I'm going to note that Maxis uv mapped many skirts (even though they flare) with straight lines - which result in some stretching of the pattern horizontally as the skirt flares. 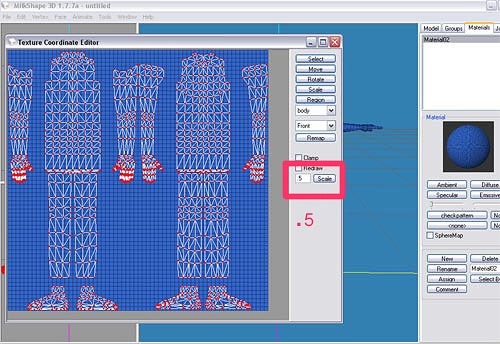 This nice square uv mapping means that trim and checks and stripes all can be put onto the skirt and will line up easily at the seams. Now, on the other hand, if you made the hem longer or shorter - you will probably want to adjust the uv map vertically to make the boxes (I used boxes on my test pattern) as equally sized as possible, so that any sort of fabric can be used on the dress, not just solid colors. 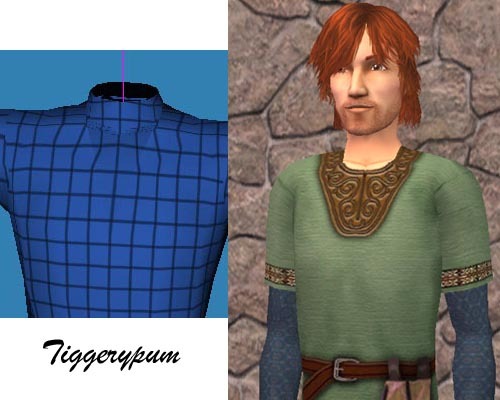 On this example mesh with the male tunic and pants, I also stretched the shirt to be longer. I was able to adjust the uvmap to distribute the stretch, by moving the map points one row at a time vertically up and down on the uv map. The lower area is still a bit stretched, but it's less obvious. As this was one of my first meshes, I think the attempt was adequate. If I had it to do over, I might move the upper pants a bit down to make a bit more room for the tunic. Now that your UV Map is changed, you will need to adjust your texture and maybe the alpha to your new layout. On the File menu, it has an option "UV map/Save"
I set the Save window to bitmap and give it a name. Then a second window opens, with several options. Set the options as you like and make sure the dimensions at the bottom are set correctly to 1024 x 1024 (for a body mesh) and that's all there is to it. For a "standard" looking black and white uv_map image, set "Groups" to "black and white", and un-checkmark "fill"
If you make objects, it works great for them too - just set the dimensions to whatever image size your object is using for it's texture. Tigger adds: For myself I usually simply take a screenshot of my map when it's set to 50% especially now that I'm working in unimesh and don't even have an obj file. The I edit it in my graphics program, removing the rest of the screenshot and then scaling it up to 1024x1024. If you are encouraging others to recolor your clothing, you can include that uvmap graphic with your mesh files, to make it easier on them. Btw, if you found this tutorial helpful, clicking on the 'Thanks' button is a good way to let me know. Is there any way to get a UV map to it once it is already attatched to the old mesh? I made my mesh in MilkShape following NeptuneSuzy's tutorial. It works fine (or seems to) except that the part of the mesh I added has no texture. So I checked the tutorials and help threads and found that it has no texture because the part I added has no UV map. I see that this thread says that for adding parts to a mesh it is recommended that you do the object first and then add it to the existing mesh so that it already comes with the mesh. Since I have already created my mesh and have already added the new part to it, is there anything I can do at this point to make that new portion I added have a UV map? Something that will allow me to texture it? It is best to uv_map the new parts before you have merged them into one of the existing mesh groups. If you have saved a .ms3d file with the new parts separate from the main groups, I would go back to that version and uv_map the parts before merging them. Depending on what the new parts are and where on the mesh you have placed them, it might be possible to uv_map them after you have merged them without disturbing the rest of the uv_map but it is a bit tricky. * Carefully select ony the new part's faces, leaving the rest of the group un-selected. 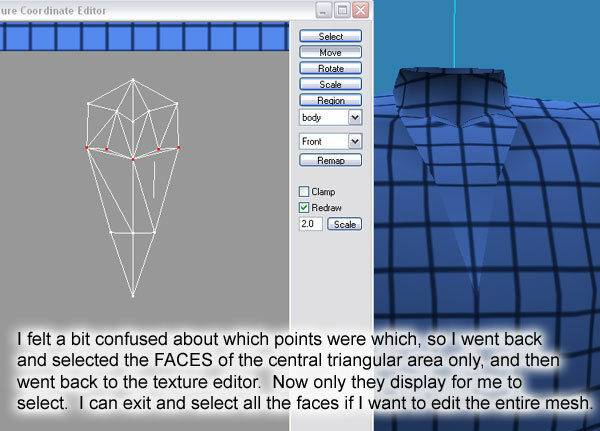 This must be done as "faces", selecting vertices won't work. * Open texture co-ordinate window. Only the new parts will be seen, which is what you want. If the new parts were made by drawing vertices and making faces of them, all will be mapped to a single dot at the top left corner, but they will be there. If you made the new parts using the primatives (cylinder, sphere, etc) they will be mapped all over the place. Either way, select a region where you want them mapped, select a mapping view, and click "remap". Then adjust by hand if necessary. * Finally, select the whole group again and "Weld Together"
#7 6th Mar 2006 at 4:43 AM Last edited by tiggerypum : 6th Mar 2006 at 4:58 AM. No one said Milkshape is free, although it does have a 30 day free trial last I checked. mmm I was directed here for a solution to "stretching" problems on meshes, well... I'm not sure I even understand the instructions up there after reading them three times, but I'll give it a shot when I get home, seeing as I can't run bodyshop or SimPE or milkshape for that matter on linux, but I still don't understand how that'll give me the alpha for the mesh, when I went to edit the texture after I created a new mesh, it was still the same shape and size as it was before, the alpha was too, even though, since the skirt was longer, logically the alpha should have been longer as well, just how do you generate a new alpha bmp to use as a "pattern" for your mesh? #9 11th Apr 2006 at 9:22 PM Last edited by tiggerypum : 11th Apr 2006 at 9:46 PM. atrgirl. Uhm. There's 2 things involved in your meshing. If you changed the shape of the mesh (like literally if you grabbed the hem and pulled it down) you will have changed the shape without having changed the uvmap - so at this point, your mesh will use exactly the same layout as it used to - until you actually change the uvmap to match. And sometimes you need to experience things to get the hang of how they work, I know the tutorial looks weird, I find adjusting the uvmapping funky when I'm doing it. 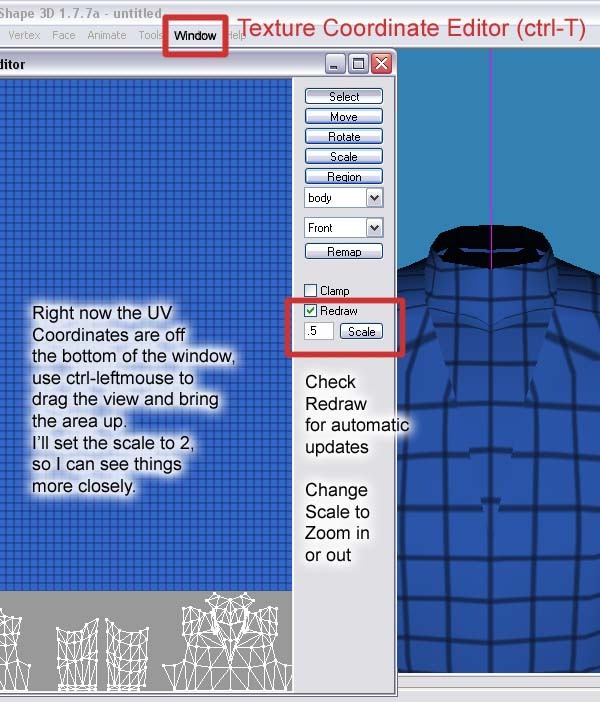 Until you have change the uvmapping, it's likely you're just going to have a stretched design. Once you fix the uvmapping - you will need to go to bodyshop and your new mesh will show up with a now broken looking design on that section -- go to new and start a new project and start a new project with the mesh with the bad design on it. Now you can go and put a new texture and alpha on that project, keep reloading it until you get it right. #10 11th Apr 2006 at 10:03 PM Last edited by atrgirl77 : 12th Apr 2006 at 12:18 AM. This isn't exactly my first skin, I've created at least 100, mostly recolors, like changing the alpha without changing the mesh. The problem I find with most tutorials is that they cover one area, there's not much about how it all ties in together. I'm going to give it another shot, see if I can modify the uv map, see what the alpha looks like afterwards. I'll edit this if there's more problems. Um, maybe I missed something, but where do I place the templates pattern? #13 26th Jan 2007 at 12:02 AM Last edited by SirDrake : 26th Jan 2007 at 12:08 AM. This message has been deleted by infiniteaegis. In 3) You talk about a bmp file. Where do I get it? In 5) You say to click on body, but nothing is there to click on... help? ShivaDark - the groups tab first... This tutorial is another view of things, but you can learn how to get around in milkshape by doing the UNIMESH tutorials. There's 3 of them. #2 covers uvmapping. happyasabunny - For putting downloaded meshes in the game, see the Game Help section. For recolouring tutorials, please see the Body Shop Skinning section. Your question doesn't really relate to this tutorial. I have edited the 'hula' maxis mesh. When I clone it in bodyshop, the files it produces give the impression that it has a seperate uvmap and graphic from the body, but when I export it back out of milkshape, the uvmap is all in one. How can I set a seperate uvmap for the alpha group of the mesh? The only thing I can think of, is after I did my editing to the mesh in milkshape, I should simply omit the step for re-adjusting the uvmap, and left it in it's original state? Would that have kept the seperate uvmap/graphics? Thats actually a good question. 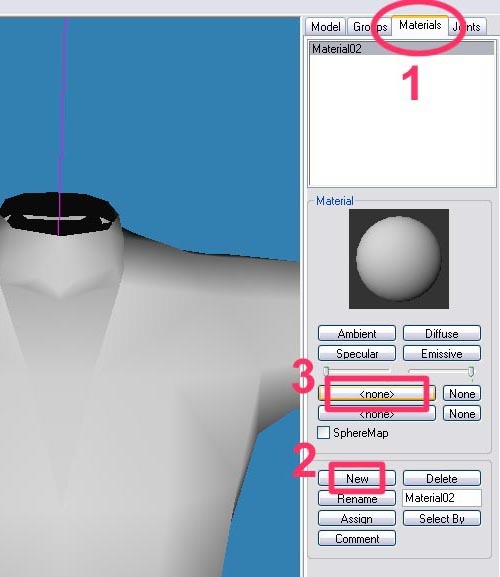 I tried modifying a mesh that I found on this website (just to learn how, it was a modification of that hula costume) and when I got to the UV Mapping, I changed the alpha mesh UV and the mesh made the Body Shop crash and it wasn't working properly... is there some other method to changing alpha UV? 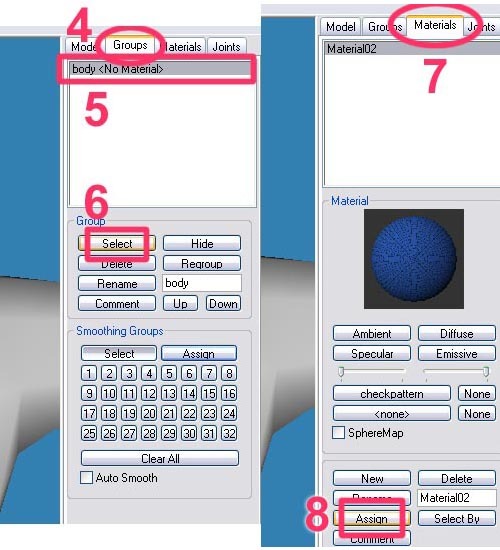 FifthAce2007 - It uses a single texture for all parts by default - this is a common thing in Maxis stuff, being economical as possible with textures, and is something that should be strived for in your own custom work whenever possible. However, if you do need a separate alpha texture/map for something elaborate, you can simply use a different texture in Body Shop for the alpha parts, remapping them in Milkshape however you like. Ken Murikumo - Remapping an alpha shouldn't cause a crash unless you did something rather odd. I've changed mapping on alphas plenty, doing several alpha tops, with no issue, and I know that hula skirt can get its mapping changed without issue as well. I think your crashing problem would be something else unless you can document the exact steps you used and have it repeat itself, changing -nothing- but the uv map. #23 2nd Oct 2007 at 7:36 AM Last edited by Ken Murikumo : 2nd Oct 2007 at 7:37 AM. Reason: Forgot an "I"
I just adjusted the skirt to be a little tighter and tried to remap it so the skirt uv is in the reletive position of the waist, like any other skirt mesh you'd find on this website. after i did that, none of the hair would display in the bodyshop, the skirt showed no sign of change and in the game itself the mesh exploded (which was kinda cool for about 2 seconds. I had seen a bit of that in my GTA meshes). And one more thing, I don't know if i'm just stupid or something, but how do I upload my own meshes onto the website? I know this isn't the place to ask, but i'm working of a decent Nightmare/Siegfried mesh and mask. Thank you for this wonderful tutorial!! What is the bmp.file? Is that the UV map? I understand the way you change it in milkshape, but where do I get it from exactly? I am converting and editing a Maxis made mesh. Is the UV map already there? So I just follow the steps described above and simply open it? Because I've read a couple of these tutorials on the internet, and some says you have to have a special program, and some says you have to draw your own map. I am really really stupidly confused rigth now. I still cannot find the .bmp file we are supposed to use as the texture. Can someone please give me the direct link to where I can download or find this file? Thanks.